At a recent Lewes FC board meeting one of the items on the agenda was the forthcoming Ground Grading inspection. This joy of joys takes place every three years and determines whether, if results dictate, we can be promoted. In recent years, some of the results of these grading inspections around the Non Leagues have been “interesting” to say the least. But just because a club can prove it can host big games, it doesn’t mean it is allowed to. I’m sure many people’s favourites for promotion from the Ryman Premier League this season is Maidstone United. Last season they gained promotion via the play-offs from the Ryman South, being able to bolster their squad with players like ex-Chelsea and West Ham full back Jon Harley. The reason why they could afford to invest in their squad was in part thanks to the installation of their 3G pitch at the Gallagher Stadium that opened a year ago. Last season, when every other Non League club saw game after game postponed, the Stones were not only able to play their games, but also hire the pitch during the rest of the week. The irony here was that during the poor weather, attendances were higher than normal as football-starved fans flocked to Maidstone for their Saturday football fix, thus adding further to the pot they can use to lure good players. Don’t misunderstand me Stones fans. I applaud your resolve during the dark days and would only wish our footballing authorities would see common sense. But what many people don’t realise is that the current grading rules mean that The Stones will not be able to take their place in the Conference, should they win promotion, because of the pitch. The FA’s rules state that the pitch cannot be used in competitions featuring Premier League, Football League or Conference teams. Not only does this preclude Maidstone from promotion, but as the rules stand, they are not able to play any home FA Cup past the Fourth Qualifying Round at home. So Maidstone could host a sell-out game versus Lincoln City, Stockport County or FC United of Manchester but not against Accrington Stanley or Morecambe. It is also possible (possible not probable note) that Maidstone could win the FA Cup and qualify for the Europa League where they could then host any European site on the artificial turf. Yet the FA still promote the use of 3G pitches, even going as far as producing a booklet extolling their virtues. The introduction seems to contradict their stance with regard to professional football:- “The Football Association is fully supportive of the use of the Football Turf (3G) artificial pitches in the National Game. The FA recognises the value and benefit Football Turf facilities to all involved in the game and the positive impact these facilities have had and will have in the future.” Compare Maidstone’s situation with their neighbours up the A249, Sittingbourne. At the end of last season, Sittingbourne took the decision to move out of their Bourne Park which was in desperate need of modernisation. They agreed a ground-share with Southern Counties East League side Woodstock Sports a few miles away. Alas, the ground-grading gremlins have already had their say, ruling that Woodstock’s Broadoak Road ground was not quite fit for Ryman League football in its current state, forcing them to the seaside for the opening few games to share with Whitstable Town. The irony here is that the ground was able to host FA Cup and Vase competitions, meaning that in theory Broadoak Road wasn’t allowed to host Crawley Down Gatwick but it could welcome Manchester United. Ground grading is obviously necessary to ensure that clubs moving up the leagues are able to provide a safe, secure and pleasant environment for fans, players and employees alike. But sometimes, you do wonder whether the pages relating to common sense have been torn out of the inspection manual. But back to today and a mouth-watering top of the table, local derby. Well, sort of local. With the promotion of Whitehawk and the relegation of Hastings United, Lewes sit all alone in East Sussex. The nearest teams are Bognor Regis Town to the west and Maidstone United to the North East, both approximately 38 miles away. Add in a few old Lewes players at Maidstone such as Paul Booth, and the return of feelgood football and this was the game of the day in the Non Leagues, heck, even in English football. Everyone who was anyone would surely be descending on the Gallagher Stadium, via a few local ales in the Flowerpot, on Saturday afternoon. With the rain falling all morning in biblical proportions in South East England I drive down the M20, passing coach after coach heading in the other direction heading to Charlton Athletic’s game against Doncaster Rovers. How many of those fans could say they had supported their local team in their hour of need? The last laugh certainly wouldn’t be on those football fans they left behind. 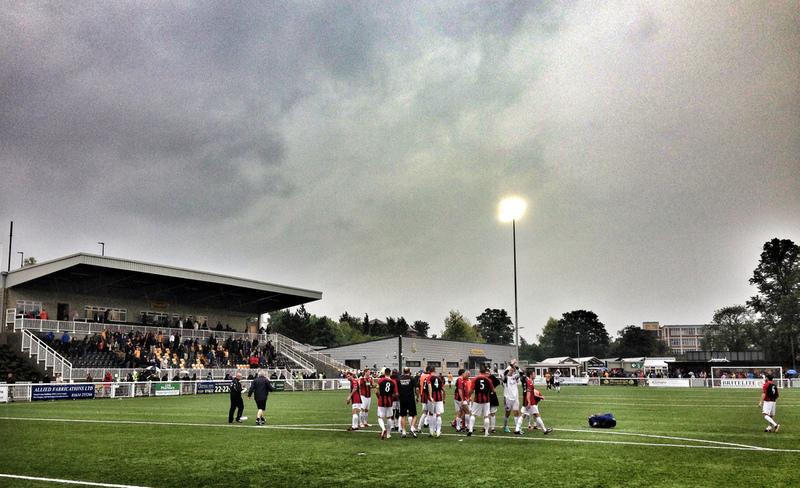 Maidstone United 0 Lewes 0 – The Gallagher Stadium – Saturday 24th August 2013 At full time, a huge cheer went up from the 70 or so Lewes fans congregated behind the goal. The torrential rain had left us soaked but our spirit wasn’t dampened. This was an excellent rear-guard performance from a team that is building in confidence in every game they play. Five games in and just one goal conceded (and that had a hint of handball about it). I’m sure many Stones fans will feel that Lewes came for a point, and in some ways they are right. The surface, the heavy rain and the lack of three first team regulars were hardly ideal factors and the mark of a good side is how they adapt to the conditions thrown at them. The 3G pitch certainly saved this game in the first instance. Two other games in the Ryman Premier fell by the wayside prior to kick off, and another couple in the league below wouldn’t see 90 minutes. In the longest ever Ryman season it is worrying that the fixture backlog has already begun. 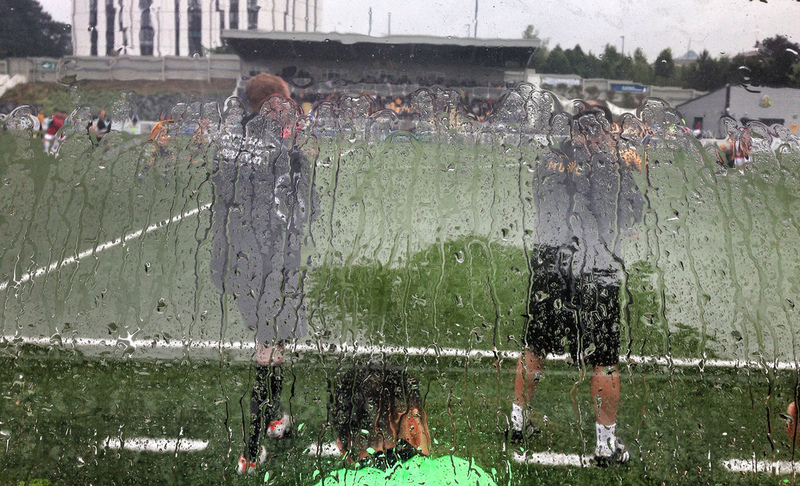 However, even the best 3G surface in the world can only cope with heavy rain so towards the end of the game the pitch was becoming unplayable in places. The style of play switched from short passing across the surface to the long-ball game as the rain was having unpredictable effects, meaning the best form of attack was defence. Maidstone had the better chances in a close game with Rikki Banks being the busier keeper, although twice the Stones had to clear the ball from their own goal line and having the final chance of the game in the last minute that would have really gone down a treat in these parts. You can’t help but admire the set up at the Gallagher. Warm welcome from all ground staff (apart from the very officious Stadium Manager who seemed to berate everyone, including his own staff), plenty of food outlets, three bars around the edge of the pitch, stewards who were helpful, cleaners picking up litter and above all fans who made themselves known. You just get the feeling the club is bound for better things, and that is why the point was greeted with such relief at the final whistle. Ah yes, the last laugh…as I headed back up the M20 to TBIR Towers I passed those very wet and sad looking Charlton fans on their coaches. Why the long faces? Well, Charlton’s game was abandoned due to an unplayable surface – a surface fit for Premier League football.